Objectives Determine the prevalence of drug use in injured drivers and identify associated demographic factors and crash characteristics. Setting Seven trauma centres in British Columbia, Canada (2010–2012). Participants Automobile drivers who had blood obtained within 6 h of a crash. Main outcome measures We analysed blood for cannabis, alcohol and other impairing drugs using liquid chromatography/mass spectrometry (LCMS). Results 1097 drivers met inclusion criteria. 60% were aged 20–50 years, 63.2% were male and 29.0% were admitted to hospital. We found alcohol in 17.8% (15.6% to 20.1%) of drivers. Cannabis was the second most common recreational drug: cannabis metabolites were present in 12.6% (10.7% to 14.7%) of drivers and we detected Δ-9-tetrahydrocannabinol (Δ-9-THC) in 7.3% (5.9% to 9.0%), indicating recent use. Males and drivers aged under 30 years were most likely to use cannabis. We detected cocaine in 2.8% (2.0% to 4.0%) of drivers and amphetamines in 1.2% (0.7% to 2.0%). We also found medications including benzodiazepines (4.0% (2.9% to 5.3%)), antidepressants (6.5% (5.2% to 8.1%)) and diphenhydramine (4.7% (3.5% to 6.2%)). Drivers aged over 50 years and those requiring hospital admission were most likely to have used medications. Overall, 40.1% (37.2% to 43.0%) of drivers tested positive for alcohol or at least one impairing drug and 12.7% (10.7% to 14.7%) tested positive for more than one substance. Conclusions Alcohol, cannabis and a broad range of other impairing drugs are commonly detected in injured drivers. Alcohol is well known to cause crashes, but further research is needed to determine the impact of other drug use, including drug–alcohol and drug–drug combinations, on crash risk. In particular, more work is needed to understand the role of medications in causing crashes to guide driver education programmes and improve public safety. We analysed blood samples for the presence of active drugs. This allowed us to determine the prevalence of recent drug use in injured drivers. Most previous North American studies were unable to distinguish between drivers with positive metabolites and those with active drug in their blood. Rather than reporting the results of drug tests performed for clinical purposes (ie, based on clinical suspicion of drug use), we analysed excess blood that had been obtained for other clinical purposes (ie, not for drug screening). In this way, we avoided the risk of selecting only drivers suspected of using drugs. This study had research ethics board approval for waiver of consent because we used excess blood that had been obtained for clinical use and was going to be discarded, and because of the procedures we put in place making it impossible to link toxicology results back to an individual driver. The advantage of this is that we avoid the selection bias that could occur if drivers who used drugs were more likely to refuse to participate. First, the excess blood volumes are small which limited analysis in some cases. In particular, we did not always have sufficient blood to perform quantification of drugs (other than cannabinoids). However, the analytic process is sufficient for the purpose of detecting presence versus absence of all drugs. Second, we obtained blood from only those drivers who had serious enough injuries that they required blood analysis as part of routine care. This means that drivers with minor injuries were not included and our findings do not apply to drivers with less severe injuries. Motor vehicle crashes (MVCs) due to impaired driving are a leading cause of preventable injury and death. Alcohol is involved in approximately one-third of serious MVCs resulting in severe injury or death. Many illicit drugs such as cannabis, over-the-counter medications such as antihistamines and prescription medications such as benzodiazepines also impair the psychomotor skills required for safe driving.1–11 Compared with drunk driving, drug driving remains poorly understood. The prevalence of drug driving is most commonly determined in either (1) roadside surveys of drivers selected from the general driving population, (2) in studies of injured drivers after a crash or (3) in coroner's studies of fatally injured drivers. The major limitation of typical roadside surveys is the high refusal rate which is approximately 20% in recent North American surveys.18 Coroners often test fatally injured drivers for alcohol and other drugs, so coroner's data provide an opportunity to estimate the prevalence of drug driving. Unfortunately, coroner's data may be subject to selection bias if testing is done based on suspicion of drug use rather than routinely in all drivers. In addition, some coroner's services measure and report the presence of inactive metabolites (ie, from urine testing) rather than testing blood samples for the presence of active parent compound. A final limitation of coroner's data is that the prevalence of drug use in fatally injured drivers may differ from that in less severely injured drivers. Another important population to study is injured drivers treated in hospital. The prevalence of drug use in injured drivers has been studied in several European countries as part of the Driving Under the Influence of Drugs (DRUID) project,19–21 as well as in Australia22 and Hong Kong.23 North American studies of the prevalence of drug use in injured drivers have been conducted in Toronto (1993),24 Colorado (2001),25 Chicago (1994)26 and Baltimore (2005).27 A recent study from Halifax and Toronto (2014) reported the prevalence of recent alcohol or cannabis use in injured drivers but did not report the prevalence of other drugs.28 Most prior North American studies determined drug exposure by measuring the presence of common drug metabolites in urine samples and therefore do not provide accurate estimates of recent drug use. Furthermore, the information is dated. The current study is part of an ongoing project investigating the role of cannabis in MVCs. The aim of the current paper is to determine the prevalence of drug use in injured drivers treated in British Columbia (BC) trauma centres. Secondarily, we report the identity of the drugs that are detected and the demographic characteristics of the drivers with positive drug tests. This study was approved by the University of British Columbia Clinical Research Ethics Board and by the research ethics boards of the Vancouver Coastal Health, Fraser Health, Interior Health, Northern Health and Vancouver Island Health Authority. Permission was granted to waive consent because of the careful procedures developed to protect personal information. In particular, our data handling process ensured that no individual driver could be linked to his/her toxicology results. Drivers treated in the emergency departments (EDs) at seven participating BC trauma centres between 2010 and 2012 were identified prospectively. All injured automobile drivers who had blood obtained within 6 h of the crash were eligible. The decision to obtain blood samples was made by the treating physician. In general, blood was obtained when there was a possibility of serious injury based on history (eg, high-speed crash or side impact collision) and/or physical examination (eg, abnormal vital signs or other clinical evidence of potential serious injury). Note that clinicians did not receive the results of drug testing from this study and suspicion of drug use was not a criterion for obtaining blood samples. If drug testing was indicated clinically, it would be done on urine samples in the hospital laboratory and not as part of this study. Drivers were excluded if blood samples were not obtained within 6 h after the crash, no excess blood remained after clinical use or if they were drivers of a motorcycle or commercial vehicle. Drivers were identified using methods that best fit with the workflow at participating hospitals. At the largest hospital, injured drivers are flagged electronically on registration and research assistants identified injured drivers through daily review of an electronic report. Tracking of included and excluded drivers at this site was done using electronic flags. At other centres, charts of injured drivers who had blood testing done were flagged by clinical staff. We were unable to review all ED charts at these sites over the course of the study, but we completed a 1-month comprehensive review of all ED charts at these sites to estimate the numbers of excluded drivers (figure 1). Estimated numbers of drivers over the study period. These numbers are estimated on the basis of a comprehensive chart review of all ED visits at participating sites. *Different sites participated in the study for different lengths of time. The total number of ED visits counts total visits for each site during the times that the site was enrolling patients. **The proportion of drivers who had bloodwork obtained varied by study site from 6% to 58%. ***The most common reason for blood being unavailable was that the blood was discarded before research assistants could identify injured drivers and inform the lab. ED, emergency department. In all centres, once injured drivers were identified, research assistants reviewed health records (paramedic and ED records) and identified those who had bloodwork obtained within 6 h of the crash. For these drivers, research assistants went to the hospital laboratory and obtained excess blood if any remained after use for clinical care. This usually occurred between 24 and 48 h from time of blood draw. Blood was relabelled with a study ID replacing patient name, frozen and transported to the British Columbia Provincial Toxicology Centre for later analysis. Health records including ambulance records of injured drivers were reviewed and basic demographic and medical information was recorded. We recorded all medications given as part of clinical care, either in ambulance or in the ED, prior to blood draw. These ‘post-crash’ medications were accounted for when reporting the medications detected in driver blood samples. For all drugs suspected of impairing driving ability, we report the percentage of drivers who test positive according to age, gender and time of day. We also report the percentage of drivers who had drug levels above the Norwegian legal limit.17 We report unadjusted ORs with 95% CIs and use χ2 tests to compare the prevalence of drug use among drivers of different ages, genders and crash characteristics. During the study period, 1097 drivers met study criteria and had blood analysed for drugs. The majority of drivers in our samples were between the ages of 20 and 49 years, and 63.3% were male. Most (73.0%) drivers were brought to hospital by ambulance, 47.5% required a CT scan and 29% were admitted to hospital. Blood samples were obtained a median of 87.2 min (IQR=52–105 min) from the time of crash. Table 1 shows the general characteristics of these injured drivers. Alcohol was present in 17.8% of drivers. Most alcohol-positive drivers (86.7%) had alcohol concentrations that exceeded the Canadian federal legal limit of 0.08%. Alcohol was detected more often in male (23.0%) than in female drivers (8.4%) (OR=3.26, 95% CI 2.17 to 5.01), and in drivers under the age of 30 years (OR=3.64, 95% CI 2.61 to 5.08). Drivers who required admission to hospital (OR=1.89, 95% CI 1.35 to 2.64) and those involved in night-time crashes (OR=12.45, 95% CI 8.23 to 18.84) or in single-vehicle crashes (OR=6.99, 95% CI 4.91 to 10.06) were also more likely to have used alcohol (table 2). The second most common recreational drug, and most common illicit drug, detected was cannabis: 12.6% of drivers tested positive for cannabis metabolites (THC-COOH), 7.3% were positive for Δ-9-THC and 3.0% had Δ-9-THC > 3 ng/mL (the Norwegian legal limit). Δ-9-THC was more often detected in male drivers (OR=2.17, 95% CI 1.23 to 4.02), in drivers aged under 30 years (OR=2.29, 95% CI 1.40 to 3.72) and in those involved in single-vehicle crashes (OR=1.64, 95% CI 1.00 to 2.65). Δ-9-THC was not found significantly more often in drivers admitted to hospital nor in those involved in night-time crashes or weekend crashes. Drivers aged under 30 years were more likely to have Δ-9-THC >3 ng/mL (OR=2.73, 95% CI 1.28 to 5.85), but Δ-9-THC >3 ng/mL was not found significantly more often in other groups of drivers (table 2). Cocaine was positive in 2.8% of drivers and amphetamines in 1.2%. We found a high prevalence of morphine (6.0%) in this sample of injured drivers. After excluding cases where morphine was given prior to blood draw by paramedics (n=21) or in the ED (n=22), morphine was detectable in 23 cases (2.1%). Our analysis did not allow us to identify which morphine-positive cases, if any, were due to heroin use. Heroin is not detected in blood samples since it is rapidly metabolised to 6-acetylmorphine and then to morphine. Identification of heroin requires analysis of either urine or saliva samples which we did not have access to.12 (table 2). Medications including benzodiazepines (4.0%), zopiclone (0.6%), antidepressants (6.5%) and opiates including morphine (4.8%) were also detected. Benzodiazepines were detected in 55 drivers (5%), but 13 of these were given benzodiazepines by medical staff prior to blood draw, so benzodiazepines were used by 42 drivers (4.0%) prior to the crash. Similarly, the antihistamine diphenhydramine was detected in 121 drivers (11.0%), but 75 of these had been given the antinauseant dimenhydrinate by paramedics or hospital staff prior to blood draw. Treatment with dimenhydrinate (diphenhydramine-8-chloro-theophyllinate) will produce a positive test for diphenhydramine, so we excluded these 75 cases. Therefore, 46 drivers (4.7%) had used diphenhydramine prior to the crash. In total, 19.9% of drivers were positive for at least one sedating medication. Drivers aged under 50 years (OR=0.67, 95% CI 0.49 to 0.92) were less likely to test positive for a medication, and those who were admitted to hospital (OR=2.50, 95% CI 1.82 to 3.44) had the highest rate of medication use (table 2). Overall, 40.1% of drivers tested positive for alcohol or at least one impairing drug and 12.7% tested positive for more than one substance. The most common combinations of drugs were medications plus recreational drugs (3.5%), alcohol plus cannabis (ie, Δ-9-THC positive—1.6%), alcohol plus medications (2.4%) and alcohol plus recreational drugs (2.3%) (figure 2). Compared with non-drinking drivers, drivers who had been drinking were more likely to also use other drugs. In particular, cannabis and alcohol were often used together and drivers who tested positive for alcohol were also more likely to test positive for cannabis and vice versa (figure 3). Polysubstance use. This Venn diagram shows the number and per cent of drivers testing positive for various combinations of substances. The font size for each drug combination is proportional to its prevalence. Prevalence of alcohol, cannabis and other drug use. This figure shows the prevalence with 95% CIs of alcohol (top panel), cannabis (middle panel) and other drug use (bottom panel) in three groups of drivers: all drivers (black lines), alcohol-positive drivers (red lines) and Δ-9-THC-positive drivers (green lines). As seen in this figure (top panel), cannabis-positive drivers were more likely than other drivers to have also used alcohol. 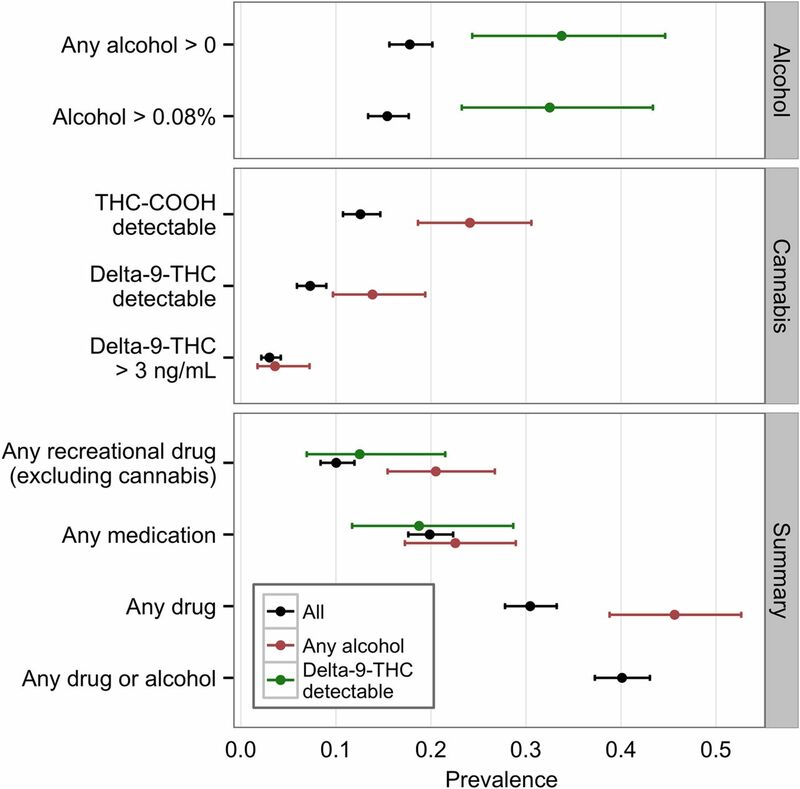 Similarly (middle panel), alcohol-positive drivers are more likely than other drivers to be cannabis users (detectable THC-COOH), or to have recently used cannabis (detectable Δ-9-THC), but were not more likely to have Δ-9-THC levels above the Norwegian limit of 3 ng/mL (middle panel). The lower panel shows that alcohol-positive drivers were more likely than other drivers to have also used a recreational drug other than cannabis. Δ-9-THC, Δ-9-tetrahydrocannabinol; THC-COOH, tetrahydrocannabinol carboxylic acid. After alcohol, cannabis was the next most commonly detected recreational drug. Like alcohol, cannabis impairs driving ability4 and increases the risk of crashes, although to a lesser extent than alcohol.14 ,36–38 We found evidence suggesting recent cannabis use (THC positive) in 7.3% of drivers. We also found that 3.0% of our drivers had Δ-9-THC levels above the Norwegian legal limit (THC=3 ng/mL) and 12.6% were cannabis users (ie, THC-COOH positive). Δ-9-THC >3 ng/mL was more common in males and in drivers aged under 30 years but, unlike the case with alcohol, was not seen more commonly in drivers admitted to hospital, nor in those involved in night-time or single-vehicle crashes. It is possible that the numbers of drivers who use cannabis will increase with the recent boom in medical marijuana dispensaries of BC. In addition to alcohol and cannabis, we found significant numbers of drivers who tested positive for illicit stimulants (cocaine, amphetamines). Stimulants actually improve some measures of driving ability such as reaction time,39 ,40 but in higher doses, stimulants impair judgment and are found to increase the risk of crashing in some studies.38 ,41 We also found a high prevalence of the antihistamine, diphenhydramine. Diphenhydramine, often sold under the brand name Benadryl, is a common over-the-counter antihistamine that is used to treat allergic reactions, as a sleep aid (eg, Nytol), and as an ingredient of the antinausea medication Gravol (as dimenhydrinate). Antihistamines cause drowsiness and are known to impair driving performance.42 Other sedating medications including opiates (morphine, codeine, methadone), benzodiazepines, Z-drugs (zopiclone) and antidepressants (tricyclic antidepressants, selective serotonin reuptake inhibitors, etc) were also common. Medications were most common in drivers aged over 50 years and in those requiring hospital admission. In BC, the prevalence of drug and alcohol use in non-crash-involved drivers has also been studied in a series of roadside surveys which studied consenting drivers during weekend evenings and nights. In the most recent survey (2012), 6.5% of drivers had been drinking and 7.4% tested positive for another impairing drug, most commonly cannabis or cocaine.48 Although our crash-involved drivers cannot be directly compared with drivers from the roadside survey, the fact that we found a much higher prevalence of drugs (other than cocaine) in crash-involved drivers supports the belief that drug use predisposes to crashes. Our study has several important strengths. Instead of using urine samples, we analysed blood samples to determine the prevalence of recent drug use in injured drivers. Most previous North American studies were unable to distinguish between drivers with positive metabolites and those with active drug in their blood. An additional strength is that, rather than reporting the results of drug screening performed for clinical purposes (ie, based on clinical suspicion of drug use), we analysed excess blood that had been obtained for other clinical purposes (ie, not for drug screening) and that remained after clinical use. 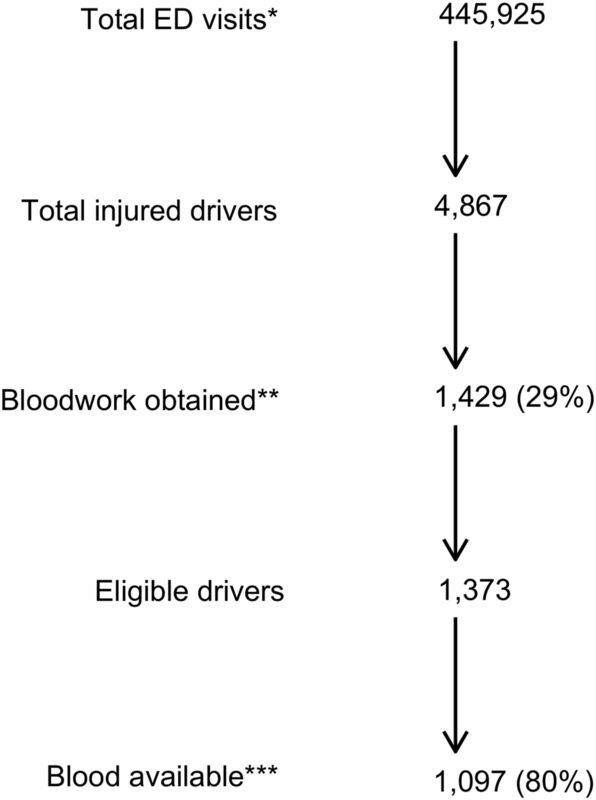 In this way, we studied a more representative sample of injured drivers who required bloodwork as part of their clinical care and avoided the risk of selecting only drivers who were suspected of using drugs. In addition, this study had research ethics board approval for waiver of consent because we used excess blood that had been obtained for clinical use and was going to be discarded, and because of the procedures we put in place making it impossible to link toxicology results back to an individual driver. The advantage of this is that we avoid the selection bias that could occur if consent was required and drivers who used drugs were more likely to refuse to participate. Our study also has several weaknesses that result from our reliance on excess blood. First, the excess blood volumes are small which limits analysis in some cases. In particular, we did not always have sufficient blood to perform quantification of drugs (other than cannabinoids). However, the analytic process is sufficient for the purpose of detecting presence versus absence of all drugs. Second, we obtained blood from only those drivers who had serious enough injuries that they required blood analysis as part of routine care. This means that drivers with minor injuries were not included and our findings do not apply to drivers with less severe injuries. Alcohol, cannabis and other impairing drugs were commonly detected in injured BC drivers. Alcohol and cannabis were both found more commonly in males and in drivers aged under 30 years. Many drivers used alcohol and cannabis together, resulting in increased impairment. Legal impairing medications were also commonly detected. Medications are used more often in drivers aged over 50 years and in drivers who require admission to hospital after a crash. Alcohol and, to a lesser extent, cannabis are known to cause crashes. Our findings suggest that alcohol continues to be the most important cause of impaired driving, followed by cannabis. The number of drivers using cannabis may increase with the growing numbers of medical marijuana dispensaries in BC and with legalisation of marijuana in some US states. Impairing medications are also a significant concern and, as the population ages, the prevalence of medication use by drivers is likely to increase even higher. The crash risk associated with most impairing medications is poorly studied and more work in this field is required to inform educational programmes designed to prevent medication-involved crashes. In addition, many drivers use several drugs in combination and more research is required to understand the risk of impairment associated with polysubstance use. As the population ages, the prevalence of medication use by drivers will likely increase. More work is needed to understand the role of medications in causing crashes to guide driver education programmes and improve public safety. The authors thank Stirling Bryan, PhD, and Henk Van Zyl, MD, for their input and support.
. Results from epidemiological research—Prevalence, risk and characteristics of impaired drivers. Bergisch-Gladbach, Germany: Federeal Highway Research Institute, 2011.
. Prevalence of drugged drivers among non-fatal driver casualties presenting to a trauma centre in Hong Kong. Hong Kong Med J 2010;16:246–51.
. The role of the drinking driver in traffic accidents (the Grand Rapids Study). Blutalcohol 1974;11(Suppl):7–13.
. Proportion of injured alcohol impaired drivers convicted of a criminal code offence in British Columbia. Can J Emerg Med 2004;6:80–8. Contributors This study was designed by JRB and HC with input from all the authors. HC managed study logistics as a whole. WM and WS oversaw toxicological analysis with input from OD. GA, JE and AL helped with study logistics. RB provided help with statistical analysis. MA, OD, RM, SM and RP provided content expertise. All authors were involved with manuscript writing. Funding This study was funded by the Canadian Institutes of Health Research. Dr Brubacher's research is supported by a scholar award from the Michael Smith Foundation for Health Research. Ethics approval The University of British Columbia Clinical Research Ethics Board.